How to get married on the beach and say "I do" at a dream resort. Your guide to planning a destination resort wedding in Asia, tips, formalities, romantic locations from beach to desert palaces and more. A guide to the best Asian resort beach weddings from Sanya and Bali to Vietnam, Phuket, Goa and The Maldives with ceremonies, blessings, priests and monks. Take your pick. DREAMING OF doing it on the beach, in a jungle, on a cliff overlooking the ocean or amongst tropical corals under the sea? We're talking about getting married, of course. Destination weddings are all the rage and were back in the spotlight as Indian movie celebrity Priyanka Chopra wed American musician Nick Jonas in a lavish Christian ceremony followed by a Hindu ceremony at the palatial Umaid Bhawan Palace Jodhpur in Rajasthan, India, end November 2018. The festivities continued into December with painstaking 'puja', 'mehendi' henna rituals and the 'sangeet' dance event and clothes by Ralph Lauren with a pink-and-green (for men) and peach (for women) colour coordination necessitating a pop-up store on site for guests. Consider the work that went into all that. It's all in a day's work for hotels that cater for such lavish events. Leaving aside the desert and the dunes, for pure wedded bliss, it's hard to beat Asia's top romantic beach resorts. It's not a question of whether to do it, it's a question of where - the options are myriad. Here's a no-holds-barred guide to resort weddings in Asia from quiet Christian blessings to colourful Hindu, Muslim and Buddhist ceremonies to tame - but ball-and-chain legal - civil ceremonies. Also see our detailed guide to corporate meetings in Asia. First things first. Many resorts cater for weddings or blessings, as well as renewal of vow ceremonies, and in most cases your hotel will arrange everything - from flowers and traditional costumes to the actual ceremony, photography and wedding feast. Often staff will assist with legalities too, but you must ensure that all your own paperwork is in order. For a marriage to be legal in Indonesia, the law requires two separate ceremonies: a religious ceremony (Christian - Protestant or Catholic - Muslim, Hindu or Buddhist), followed by a civil ceremony performed by a government registrar. Before the wedding, you must apply in person for a "certificate of non-impediment", issued by your country's embassy or consulate. (If you only have the religious ceremony, you will receive a church marriage certificate only.) Remember that a Balinese traditional ceremonial blessing, or a northern Thai-style Lanna blessing, is a blessing only, even though it is usually held in true wedding style. 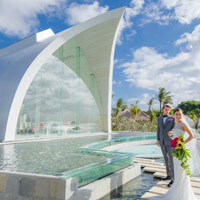 Bali Weddings International (www.baliweddingsinternational.com), owned by an Australian married to an Indonesian, has been around for 15 years and will arrange every aspect of your wedding in Bali. Bali Wedding Bells (www.baliweddingbells.com) offers everything from wedding consultants and planning services to a variety of villas and hotels. You may also want to check out the informative site of Tirtha Bali (www.tirthabali.com), with details and photos of couples whose weddings were previously organised by the company. 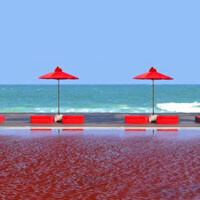 Bali Wedding Butler (www.baliweddingbutler.com) also offers a full range of wedding options. Phuket, Thailand, is another dream wedding destination, with Thai Buddhist weddings particularly popular among foreign visitors. To be legally married, both partners have to visit their embassies in Bangkok at least a week before the wedding to sign declarations that both are free to marry. Once signed and witnessed, the forms must be translated into Thai and taken to the Ministry of Foreign Affairs in Bangkok to be certified (use a local agency to assist with this process). The paperwork must then be taken to the local district office where the ceremony is going to take place (Phuket, for example), to arrange an appointment to register your marriage (the legal part of the marriage). Agents such as Bangkok Translation Office (e-mail: bkk@email.com) can help you with this. Once all is in order, you can have your religious wedding ceremony - traditional Thai, Buddhist or Christian. Phuket Weddings (www.phuket-weddings.com) provides information on everything from sunset beach ceremonies to five-star hotel and beach resort weddings, while Phuket Discovery (www.phuket-discovery.com; click on "Wedding packages") will also help with legalities and paperwork (for a fee). Thailand Weddings (thailandweddings.com) does not only organise weddings, but has excellent information about different kinds of ceremonies in northern Thailand, legal requirements and more. Also see www.phuket.com for more useful information. The Amari hotel group has informative and not too excrutiatingly expensive Thai weddings pages on its website like this one for Amari Phuket (www.amari.com/phuket/weddings.aspx). For something stylish and upscale explore Four Seasons (www.fourseasons.com/weddings/). Both Muslim and civil marriages are legal in Malaysia, but first you have to sign a declaration that there are no legal obstacles to your marriage. You have to be in the country for seven days before you can give 21 days' notice of your intention to marry. You can get married at a registrar office, or during a religious ceremony where the church or temple official is an appointed assistant registrar. Your marriage certificate has to be validated by the Malaysian Foreign Affairs Department, as well as your country's embassy, in order for it to be recognised back home. Documents needed include your birth certificate and a certified “certificate of single status”. All the documents must be originals and certified by the Malaysian embassy or High Commission in your home country. You will also need three colour passport photos. 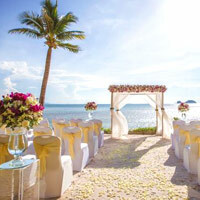 A number of Malaysian resorts will assist with your wedding and marriage arrangements. India offers some breathtaking locations for resort weddings, whether it's at a historic palace in Jaipur (where there's lots and lots of sand), the backwaters of Kerala, or at a beach resort in Goa. Regal Weddings (www.regal-weddings.com) will facilitate Christian and Indian (Hindu, Gujerati, Sikh or other) ceremonies. Gold Aisle (www.goldenaisle.com) specialises in co-ordinating weddings for foreign nationals in Goa. Wedding Planner Goa (www.weddingplannersgoa.com) also caters for foreigners with traditional Indian theme weddings as well as Goan Christian weddings. It operates as a an Indian wedding planner too with help on wedding gowns and accessories. Exotic Indian Weddings (www.exoticindianweddings.com) offers venue options and wedding planners to help you navigate ceremonies in India. The companies serves up royal palace weddings, exotic beach ceremonies, Kerala weddings on houseboats on the backwaters as well as more unusual 'LGBT Weddings'. If you want to marry in Goa, you need to arrive at least 15 days before the wedding, so that the paperwork (including a court hearing to get permission to marry) can be finalised. In addition to presenting your birth certificates, both parties have to get "no impediment for marriage" certificates from the local Death, Birth and Marriage Registration office. If one of you is divorced, you need proof of this too. Foreigners wanting to get married in the Philippines need to get a "certificate of legal capacity" from their consulate or diplomatic representative. A marriage licence application can then be made at the local civil registrar office. Documents include any existing divorce decree (or a death certificate if one of the parties has been widowed). There is a 10-day waiting period before the marriage licence is issued. Once issued, it must be used within 120 days. The marriage must be solemnised by a priest, imam or member of the judiciary. The stunning picture-postcard Maldives is an obvious resort wedding choice - but non-Muslims cannot get legally married there, although several resorts offer memorable non-binding ceremonies. Have your legally binding ceremony at home. Getting legally married in Dubai can be complicated so it’s best for couples to consult with relevant embassies on whether a Dubai wedding will be legally recognised in their home countries. In any rate, it is always worth double-checking with your embassy in the country where you intend to get married. With the Internet at your fingertips, and the immediacy of e-mail, your wedding can be arranged from afar, especially if your resort is geared to destination weddings, or if you have a reliable wedding planner on the other end. Even so, you need to be cautious: Ross advises that you get everything in writing and pay as little money as possible upfront. Get itemised lists of everything, demand references and check up on them. So, what are your options? Too many to seriously mention, but here are a few. The Conrad Maldives Rangali Island (www.conradmaldives.com) is a spectacular twin-island setting with seas so blue you may end up spending more time caressing your Sony camera than your spouse-to-be. Water bungalows step right into azure lagoons rich with curious fish, and a romantic stilted above-water spa complex will take care of any post-nuptial aches. 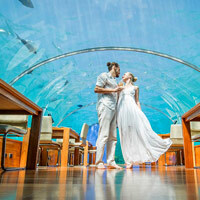 You can choose to have your ceremony in the “Chapel of Love” – a pavilion overlooking the lagoon, in “Ithaa” the world’s premier glass chapel under the sea, or among the corals, complete with an audience of fish. The beach villas were smartly revurbished in 2016. Also check out the intimate Angsana Ihuru Maldives (www.angsana.com/en/maldives/ihuru), which is an almost perfect intimate place to propose, get wed and celebrate a honeymoon in; and the hideaway Gili Lankanfushi (www.gili-lankanfushi.com, formerly Soneva Gili by Six Senses) in the North Male atoll where an over-water chapel awaits followed by sunset dhoni cruises. And now enjoy the Sun Aqua Iru Veli by the Sun Siyam Resort Collection (November 2018, www.iru-veli.com/), a major redevelopment with freshwater pool villas (and suites) and a mix of beach and overwater accommodation. 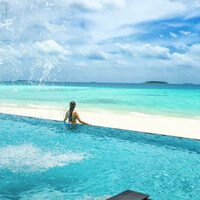 The resort is on Aluvifushi island in South Nilandhe Atoll, within a private lagoon. Renew your vows or organise a romantic Maldives beach wedding that will fill all your megapixel cameras. Four Seasons Resorts (www.fourseasons.com) can handle several aspects of the wedding ceremony or blessing with the degree of options varying region by region depending on local legal requirements. 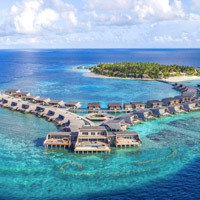 In the Maldives check out the swish Four Seasons Resort Maldives at Kuda Huraa, with its bungalows, some over-water right above the cavorting marine life, and the second Four Seasons Resort Maldives at Landaa Giraavaru. Leave your footprints in powder-white sand. Check out the Four Seasons wedding site for more details on options. Those content with a non legally-binding ceremony could consider a private-island affair courtesy of the One&Only Maldives Reethi Rah (www.oneandonlyresorts.com). With a rose-petal-strewn aisle along a white beach and a private, personalised candle-lit dinner under the stars, those legal worries may just fade away. Banyan Tree Resorts (www.banyantree.com) offers romantic wedding packages at its Maldives, Phuket, Bintan, Bangkok, Lijiang, Shanghai, Bali, and Seychelles properties. 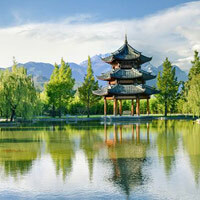 Also explore the verdant and secluded Angsana Xi'an Lintong. Exchange vows among the corals at the Banyan Tree Maldives Vabbinfaru (www.banyantree.com/vabbinfaru) looking out over some of the bluest waters in the world. The coral-fringed island offers sugar-white sand, luxury accommodation, and an unbeatably romantic location for a destination wedding to remember. Two newer upscale wedding island choices in the Maldives are the Fairmont Maldives at Sirru Fen Fushi (www.fairmont.com/maldives/) with its 120 villas and iconic 200m swimming pool cutting across the narrow island, and uniquely-designed The St Regis Maldives Vommuli Resort (www.marriott.com/st-regis-maldives). Finally, for something very intimate and uber chic if the wallet will stretch, look at Cheval Blanc Randheli (www.chevalblanc.com/randheli/) for a customised wedding option. In Langkawi, in a lush rainforest setting fronting an arcing bay, The Datai (www.thedatai.com/) offers intimate weddings, blessings or renewal of vows ceremonies. The hotel - that returns from a major overhaul by December 2018 - will arrange everything, from flowers, photography, table settings and the provision of a "tropical wedding cake", to flying in a pastor from mainland Malaysia. They can also provide witnesses and help with the filing of paperwork. This is a cosy and private cove with some of the best white sand on the island. Another romantic option on Langkawi is the Westin Langkawi Resort & Spa, formerly the Sheraton Perdana Resort (www.marriott.com/westin-langkawi/), where there are indoor and outdoor locations for the vows, including a jetty with a covered gazebo and spectacular views of the Andaman Sea. You can also tie the knot in a white marquee or in a pavilion at the stunning, Moorish, Four Seasons Langkawi. Then let it all sink in at a candlelit table for two. Opened April 2016 The St Regis Langkawi (www.marriott.com/st-regis-langkawi) adds fresh zest to the weddings mix. This is an unabashedly luxury retreat, offering what it likes to describe as 'bespoke weddings' with a 150-person ballroom, great sea views, an excellent spa, and wedding planning by the mile. Is 7,728sq ft enough for your guests? Well, it'll have to do. In Penang look no further than Shangri-La's Rasa Sayang Resort & Spa (www.shangri-la.com/penang/rasasayang/) with its stately manicured estate right on the beach. Neighbour Lone Pine (www.lonepinehotel.com/) on Batu Ferringhi Beach has a large lawn and casuarina grove as well that offers a more modestly priced option and space - despite the luxury boutique hotel moniker - while the gorgeous white-starched E&O (www.eohotels.com/) in Georgetown (Penang) presents a splendid colonial setting for island weddings in Penang. And if you'd like, refer to the hotel by its full name, Eastern & Oriental. Its Grand Ballroom can easily manage up to 400 persons. No beach but sea vies and oodles of atmosphere. And so, to Sabah. In Kota Kinabalu, the Shangri-La's Tanjung Aru Resort and Spa (www.shangri-la.com/tanjungaru) offers a "Solemnisation Package", sensibly including the registrar office service, a civil marriage celebrant and photography services. The resort also advises couples on the necessary formalities to make the marriage legal. Shangri-La’s Rasa Ria Resort (www.shangri-la.com/rasariaresort/) offers ceremonies on the beach and similar services to its sister resort, Tanjung Aru. 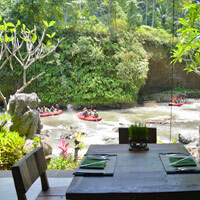 The Rasa Ria has its own slice of the Borneo jungle as its backdrop so orangutans may be quiet observers while you wed. Weddings can also be arranged at the smaller Sipadan-Kapalai Dive Resort (www.sipadan-kapalai.com), although it might be a little more complicated for guests to get there. Divers will be extremely happy campers here though. Another popular Malaysian wedding destination is Pangkor Laut island in the Straits of Malacca, housing the acclaimed Pangkor Laut Resort (www.pangkorlautresort.com), where it is possible to exchange vows during a two-hour Catholic, Methodist or Anglican wedding ceremony cruise on a large luxury yacht (maximum 18 passengers). Sailing blissfully into this sunset doesn't come cheap though. For a less extravagant union, you can also choose to have the proceedings on the beach. Tioman Island is rather exotic and a bit farther off the normal wedding radar. Berjaya Tioman Resort (www.berjayahotel.com) caters for formal weddings in its ballroom, or more intimate and casual ceremonies on the beach. The Berjaya group also offers wedding options in Penang, Langkawi and Redang Islands. Prefer to tie the knot in Thailand with a grand destination wedding? For style and elegance in the midst of the Bangkok bustle, look no further than The Peninsula Bangkok (www.peninsula.com/en/bangkok). The hotel offers a Thai wedding package, which includes a ceremony in a pavilion overlooking Chao Phraya River, traditional Thai wedding outfits, a "hae khan mark" (groom’s procession), musicians, dancers, dowry bowls and a whole lot more. Of course, The Mandarin Oriental (www.mandarinoriental.com/bangkok) is a gorgeous old world mainstay on the water and for fun weddings on the Bangkok river check out the Anantara Riverside (www.anantara.com/en/riverside). Other prime Bangkok choices could include the downtown completely remodelled The Athénée Hotel, a Luxury Collection Hotel, Bangkok (www.marriott.com/athenee-bangkok/), on Wireless Road - the former Plaza Athenee) with its signature grand staircase sweeping up a spacious lobby. It will handle everything from wedding planning, dresses and stuff you never even thought about to engagement ceremoniies, the Big Day and themed events like perhaps a colourful Indian wedding. Just up the road with a Grand Ballroom accommodating up to 1,200 guests the new-look Conrad Bangkok (conradhotels3.hilton.com/conrad-bangkok) at central All Seasons Place is a chic setting for modern couples or for a more traditional ceremony. Also consider the central oasis of the plush marble-slathered resort-style Siam Kempinski Hotel Bangkok (www.kempinski.com/en/bangkok), that can hold your wedding event indoors, outdoors in a garden setting, and even rustle up a Thai blessing or wedding ceremony. This is a magnificent and regal resort style confection with tall columns and cream marble at every turn with vast swimming pools in a central and green courtyard setting. While in Krungthep the Thai capital, don't miss this fabulous trio - starting with the darkly elegant The St Regis Bangkok (www.marriott.com/hotels/st-regis-bangkok/) joined at the hip to a convenient BTS SkyTrain station with grand views over the Royal Bangkok Sports Club and over 9,000sq ft of events space. 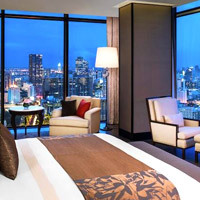 Also explore starkly contrasting cream-marble neighbour Waldorf Astoria Bangkok (waldorfastoria3.hilton.com/waldorf-astoria-bangkok) that arrived mid 2018 in a highrise setting with similar views and the Magnolia Ballroom with its eight-metre-high ceilings. The Park Hyatt Bangkok (www.hyatt.com/park-hyatt-bangkok) arrived 2017 in a gleaming alien-skin building with curves extending into the sky and a curving cream interior with feminine overtones and well segregated meeting areas for weddings and banquets. Atop Central Embassy mall, Park Hyatt too is linked to the Ploenchit BTS station. Both the centrally-located Grand Hyatt Erawan Bangkok (www.hyatt.com/grand-hyatt-erawan) and the InterContinental Bangkok (bangkok.intercontinental.com/) are very competent wedding specialists with several venues, as is the Thai-style Anantara Siam Bangkok (www.anantara.com/en/siam-bangkok) with its signature blazing mural staircase. Keep an eye out on early 2016 entrant The Nai Harn (www.thenaiharn.com/) at the romantic sunset tip of the island. 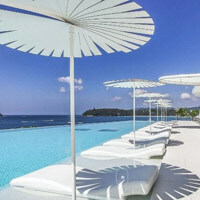 It took over and completelly remodelled the former Royal Phuket Yacht Club to turn it into a rustic-chic all-white getaway with spectacular views from sunken seats within water pools over the bay. The hotel will arrange pre-wedding beachfront shoots, organise events on a 50m rooftop deck and wedding ceremonies, with the help of an event planning team. Not far from here heading up the coast is the spectacular virginal white Kata Rocks (www.katarocks.com/) set cliffside with a stunning turquoise blue infinity pool looking out over the sea just screaming out for a pink bikini. The 34-villa hotel (called Sky Villas to get you in the mood) manages the entire process and also serves up a luxe spa to soothe nuptial nerves. The 262-room all pink Centara Grand Beach Resort Phuket (www.centarahotelsresorts.com/centaragrand) is tucked away in a secluded hilly fold with access to the beach and four swimming pools and a lazy river to take care of kids while friends set about the serious business of sorting out a Phuket destination resort wedding. 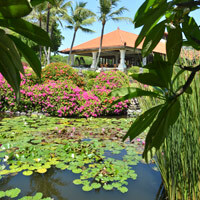 At Villa Royale (www.villaroyalephuket.com), ceremonies are conducted in a temple facade set in the garden. Opt for traditional Thai Buddhist or a Christian ceremony. Mom Tri’s Kitchen, known for both its food and wine selection, will do the catering for up to 70 guests. The Naka Phuket (opened 2013 www.thenakaphuket.com/) is a hard to find cubist hideaway but is well worth the short and steep excursion off the main road to get to a splendidly private cove with sweeping beach, a vast expanse of green lawn beckoning wedding planners and energetic kids, and a dark-tile raised pool looking onto the beach. This is a fabulous and secluded spot for beach weddings, garden strolls, and romantic events. The new Rosewood Phuket (www.rosewoodhotels.com/en/phuket) that arrived November 2017 offers extensive grounds, beach and water features for a classy Thailand destination wedding splash with a location just off Patong around the headland on Emerald Bay. At the Surin Beach midway up the Phuket west coast, Amanpuri (www.aman.com/), perched on a peninsula overlooking the Andaman Sea in Phuket, happy couples can have an informal Buddhist blessing involving up to five monks. Christian and non-religious blessings are also available. (The resort recommends that guests hold their civil ceremony in their home country.) Right next door and easier on the wallet, celebrate your love far from the madding crowd at the cheerful and welcoming Surin Phuket (www.thesurinphuket.com/), which offers Thai or Western-style wedding packages. The small-villa hotel arrayed over a hillside even has a charming green lawn setting facing the beach for sunset vows should you wish. A Buddhist Thai wedding at the elegant Twinpalms (www.twinpalms-phuket.com) involves five monks and traditional blessings with holy water. You can also have a Western ceremony, or tailor-make your own, and there is a range of locations and options for the reception, from a private romantic lunch to a large themed barbecue. This is a chic little resort, just away from the beach but close to it. Or celebrate your love with a symbolic Buddhist ceremony at the exceptionally swish Banyan Tree Phuket (www.banyantree.com/phuket) with its Pool Villas and access to a golf course. The hotel will discretely manage proposals, weddings, honeymoons and anniversaries. Get wed on the lawn, the beach or in a private villa. Trisara (www.trisara.com), a small, luxurious property with pool villas and suites facing the Andaman Sea, specialises in weddings and is happy to arrange traditional Buddhist ceremonies in private, romantic locations throughout the beachfront resort. At Trisara a wedding package for about 60 persons may be in the range of Bt135,000 with a flower gazebo, Tiffany chairs, welcome drinks and more. The hotel will manage grooming, corsage, and entertainment with a sense of style and taste. If you choose the well-established and family-friendly Dusit Thani Laguna Phuket's (www.dusit.com/lagunaphuket) "special wedding", Buddhist prayers will be complimented by a "love tree planting ceremony". Your tree will then grow on the hotel grounds. This is a legal wedding, provided you make sure all the preceding paperwork is in order. Help with the greening of Phuket. The Dusit is a friendly, welcoming sort of place without snobbery or guile. A good spot to camp out with friends for some post-nuptial revelry and more. Stylish tin-mine extravaganza The Slate Phuket (formerly Indigo Pearl Resort, www.theslatephuket.com/) offers Western-style or traditional Thai ceremonies that may be held in tropical gardens or in the resort’s restaurant, set in the middle of a small lake. Or try its Bensley Suite with superb floral arrangements. The hotel suggests a "test drive" by checking into one of its romantic suites. No test drive for the wedding itself alas. Arriving at night at the far north torch-lit JW Marriott Phuket Resort & Spa (www.marriott.com/jw-marriott-phuket) with its extensive gardens and blissful infinity pool provides all the drama and romance needed for unforgettable nuptials. In addition to Christian-style weddings for up to 400 people, you can also have a Thai ceremony. The resort's wedding manager takes care of every detail. The JW Marriott enjoys a secluded location with acres of beach to leave your footprints in. The resort is active with conservation and environmental programmes. Get wed, and then head out to save some turtles, hug a tree, or simply splash out on a sumptuous spa treatment for two. Also set on Mai Khao beach (at the end of the road leading on from the JW Marriott) is the very chic, cubist SALA Phuket Resort and Spa (www.salahospitality.com/phuket/). The resort offers about 80 smart villas and suites with contemporary design blending black-tile water pools, clean lines and gardens with beige-white exteriors in an unobtrusive lowrise setting. Expect gardens and a zen atmosphere. Other Phuket resorts offering wedding packages include the spread out and efficient beachfronting Angsana Laguna Phuket (once the Sheraton Grande Laguna, www.angsana.com/laguna-phuket/), the spacious and green Hilton Phuket Arcadia Resort and Spa (www3.hilton.com/phuket-arcadia) which also houses a romantic, dedicated spa villa complex witha few cawing peacocks, the charming Andaman White Beach Resort (www.andamanwhitebeach.com) set on a private sweeping white-sand cove amidst tall rubber trees and rolling hills, and chicly revamped old stalwart Le Meridien Phuket (www.marriott.com/le-meridien-phuket) that hosts a stretch of pristine and private beach as well as extensive water features. Krabi options include the elegant Layana Resort & Spa (www.layanaresort.com) and the hidden Rayavadee (www.rayavadee.com) set in the Krabi Marine National Park. The Rayavadee caters for smaller weddings and holds ceremonies in a candle-lit limestone cave with an ocean backdrop. On the northern tip of Phi Phi Island you’ll find the beachfront Zeavola Resort (www.zeavola.com). This 48-villa hideaway offers Western and Thai ceremonies that include the planting of a love tree and the releasing of ceremonial fish. Thai couples will also enjoy a more traditional Buddhist praying ceremony and the pouring of holy water. Additional services such as hairdressing and make-up can also be arranged. Up the eastern Phuket cape past a row of luxury residences is the grey and minimalist COMO Point Yamu (www.comohotels.com/en/pointyamu) perched unobtrusively on a low promontory, open to the winds and the elements with vast wraparound views but, alas, no beach. That is a trifling niggle in an otherwise interesting ensemble that strains to be schoolroom perfect with a relentless raw cement finish and an occasional "wow" factor like the 100m pool strung out across a sun-drenched timber deck with panoramic vistas. Just before you head off north to Khao Lak from the northeast of Phuket Island, head off 15 minutes by speedboat to the idyllic Naka Island, a Luxury Collection Resort & Spa, Phuket (www.marriott.com/naka-island-phuket/). Set amidst the stunning Phang Nga Bay and its limestone karst formations, this hideaway is a spoiling escape with far-from-rustic air-conditioning (there are ceiling fans of course for the heroically inclined). This is a self contained mini-destination that can handle a medium-sized group in luxury accommodation with stunning wedding locations. A one-and-a-half-hour drive north from Phuket brings you to the bucolic seaside resort of Khao Lak with the glittering Andaman Sea skirted by powder sand fronting spacious garden resorts like the Centara Seaview Resort Khao Lak (www.centarahotelsresorts.com/centara/csk/) set along Nang Thong Beach in the south of the Khao lak strip, the manicured and sprawling 298-room JW Marriott Khao Lak Resort & Spa (www.marriott.com/jw-marriott-khao-lak) that lies far to the north along a secluded and pristine stretch of beach, and the 56-room boutique property The Sarojin (www.sarojin.com/) Khao Lak, which also offers the Pathways spa within its 10 landscaped acres, a pristine beach, lotus ponds, tranquil walks and bicycle paths. The pioneering Aleenta group (www.aleenta.com/phuket/) promises much romance and starlight for its Full Moon Weddings at all hotels in Thailand with Phuket being a top pick for something intimate. At Aleenta Hua Hin Pranburi, expect a chauffeured car or Harley-Davidson motorcycle transfer to the beach perhaps. The group takes special care of female travellers. Check out their Aleenta wedding deals. Check out parent company Akaryn Hotel Group's portfolio too. In Koh Samui, Tongsai Bay's (www.tongsaibay.co.th) traditional Thai wedding package also includes a "long drum" procession. Take note that the ceremony is a traditional Buddhist service: monks should not be asked to pose for photos (this is considered insulting). Revealing wedding gowns are out, too. If you really have to let it all hang out, choose the resort's Western wedding package (but the ceremony is a non-binding one). If you want a legal wedding, marriage registration can be arranged but you will have to get all the necessary documents translated and approved by your embassy and the Thai foreign affairs ministry yourself. Around the hillside is the newer villa and suite The Ritz-Carlton Samui (www.ritzcarlton.com/koh-samui) that offers romantics its elevated Sala Thai for wedding ceremonies and blessings. The resort got going October 2017. Koh Samui grand wedding options include the accessible and spacious Centara Grand Beach Resort Samui (www.centarahotelsresorts.com/centaragrand) with extensive seafronting gardens and the modern and uber-cool boutique hotel The Library (www.thelibrarysamui.com/) with its timber boardwalk and blood red pool that re-emerged after a fresh facelift in 2017. The hotel is on the beach and its signature white cube residences and environs offer numerous opportunities for spectacular photographs. Also threatening lots of fun - with green space and a chic seafront vibe to boot - the new SALA Samui Chaweng Beach Resort (www.salahospitality.com/chaweng/) that started hitting its stride mid-2018 could be a high energy location or a serene escape depending on your wedding or honeymoon mood. 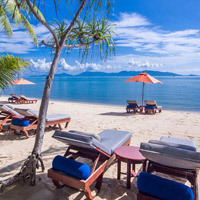 On a delicious stretch of Mae Nam beach in 23 manicured acres of green and shaded coconut groves, is the Santiburi Koh Samui (www.santiburisamui.com/). The beach area is spacious with plenty of quiet corners for lazy lounging. The sand is clean and golden. The enormous focal pool area is perfect for some more, um, lazy lounging. Santiburi works equally well for families, honeymooners and wedding planners. Beach weddings are a doddle here with acres of space to play around with. The Four Seasons is a smart option with a small yet stunning private beach though the buggy rides are vertiginous and the Six Senses Samui (www.sixsenses.com) does elaborate Samui weddings with great views all around from its perch high up a headland. The Six Senses has a remarkable spa as well with the same wraparound Cinemascope views. The resort does Thai weddings with a drum parade as well as Western nuptials. Similar breezy views can be found at the colourful and bopping W Koh Samui (www.marriott.com/w-koh-samui/) with its signature cliff-edge pool. This resort too spills down a hillside to the beach on the north shore. The hotel has 1,356sq ft of event space with the largest hosting 80 persons so an intimate wedding would be in order here. Newer and more lavish choices for a luxury wedding in Samui, include the distant cliff-top InterContinental Samui Baan Taling Ngam Resort (samui.intercontinental.com/) that also has beachfront pool villas. The hotel can host up to 200 people comfartably across 22 acres of splendid beachfront and manicured gardens, with sweeping views for those perfect photo opportunities. A long jetty stretches across the coral and rock to open blue sea. A new venue for 2018 weddings and on is the infinity pool setting where an altar is set up 'floating' on the pool. Stunning views in all directions. Another beautiful mouthful is the Vana Belle, a Luxury Collection Resort, Koh Samui (www.marriott.com/vana-belle-samui/) which, if you can pronounce it all, serves up an elegant and seafronting hillside retreat with oodles of style. 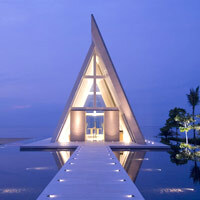 Also explore the vertiginous Conrad Koh Samui (conradhotels3.hilton.com). This is a luxury all-villa affair with space for 200 or intimate, small beach weddings with the ceremony atop a floating transparent chapel. Interesting. The views are terrific. The beach is narrow and not really swimmable but offers a romantic setting. All in this is again a much favoured spot for both weddings as well as honeymoon photos with spectacular sunset views across the bay. In Pattaya get away from the hustle and bustle of the main strip to the splendid seclusion of the InterContinental Pattaya Resort (www.ihg.com/intercontinental/pattaya). This was formerly the Sheraton and rebranded 1 April 2016. The resort, which spills down a low hillside to an artificially sanded outcrop above a stone breakwater, has a ballroom and 7,338sq ft of function space. For a fun location on a large beach strip, check out the more modestly priced thermed waterpark Centara Grand MirageBeach Resort Pattaya (www.centarahotelsresorts.com/pattaya) where mysterious turns await. The hotel though is in need of modest renovations and a fresh lick of paint. It has the size to accommodate a crowd and is a dab hand with kids. The Anantara group (www.anantara.com/weddings) has a special wedding ceremony for all tastes. Enjoy nuptials on the beach, or celebrate with a contemporary indoor Asian ceremony, at Anantara Resort Hua Hin. Away from the coast, at the Anantara Resort Golden Triangle near the border of Thailand, Laos and Myanmar, you can kick off your wedding with a choreographed elephant procession, or renew your vows overlooking the Mekong valley. A panorama of rice fields is your backdrop; Thai classical music and dancers complete the picture. In Chiang Mai, the Lanna-style buildings of the Dhara Dhevi (formerly by Mandarin Oriental, www.dharadhevi.com/) offer a magical wedding setting taking guests back in time. Couples can choose anything from a European-style white wedding to a Lanna nuptial ceremony. The stunning traditional Lanna-style Four Seasons Resort Chiang Mai (www.fourseasons.com/chiangmai/) offers unions among its pavilions or in its tropical gardens, amid verdant rice fields filled with birdsong and with mountain views. 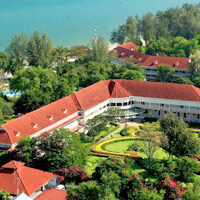 On to royal family favourite Hua Hin. While lacking a top-class beach, this area still has some of Southeast Asia's most romantic hotels, including the colonial garden-setting Centara Grand Beach Resort & Villas Hua Hin (www.centarahotelsresorts.com/huahin) that has been superbly renovated (from the former Sofitel) and expanded numerous times with modern deluxe comforts among the gracious confines of a bygone era, and the rusticly elegant Evason Hua Hin (www.sixsenses.com/evason-resorts/hua-hin). Evason Hua Hin serves up sprawling grounds with a wide choice of wedding ceremony venues: try the swimming pool with the surrounding lotus ponds, a tucked away location in the garden; or the beach. The hotel can cater for just a couple or up to 300 celebrants. Seberal wedding packages are available. For a full, traditional Thai wedding with all the trimmings, the Hyatt Regency Hua Hin (www.hyatt.com/hyatt-regency-hua-hin) has it all on tap. The hotel has 213 keys with its largest function space weighing in at 4,303sq ft. There are outdoor spaces, a 'traquility' court, and gardens. Take your pick. The hotel's wedding planners and specialists will do all the heavy lifting. The fabulous BARAI Spa is an added bonus. Farther afield, in Vietnam, the Evason Ana Mandara at Nha Trang (www.sixsenses.com/evason-resorts/ana-mandara/destination) offers wedding packages that include a wedding planner, a ceremony on the beach or jetty, a sunset cruise, a seafood dinner, flower petals and more. You take away a wedding certificate framed in leather and wood. The hotel handles weddings and re-affirmations with its planners setting it all up. Sister property Six Senses Ninh Van Bay (www.sixsenses.com/ninh-van-bay) offers a similar package, but the ceremony takes place in the resort’s wedding chapel, set on a hill with views of the bay. This is a more intimate setting and not really designed for hordes of trippers. Getting to the resort involves a 20-minute boat ride where over-water bungalows await. 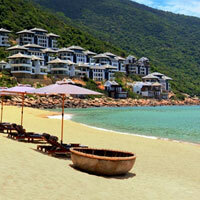 Just a 30-minute drive from Nha Trang at Cam Ranh Bay is the exquisite The Anam (www.theanam.com/) with a broad 300m swathe of golden beach perfect for weddings and romantic gatherings. This is an upscale well planned and executed 77-villa resort with colonial design touches. Several villas feature private swimming pools and the sizes range from 50sq m to an elephant-swinging 267sq m.
Some high end Vietnam weddings - beachside or hilltop - can be arranged at places like the Banyan Tree Laguna Lang Co (an hour's drive from Danang, www.banyantree.com/lang-co) with its impeccable villas overlooking a three-kilometre stretch of sand (with the staple spa facilities and an 18-hole golf course); the hugely popular black-and-white luxury InterContinental Danang Sun Peninsula Resort (a 30-minute drive from the airport, www.danang.intercontinental.com/) overlooking a private bay and splendid beach from its lofty perch on Son Tra Peninsula, also known as “Mythical Monkey Mountain”; and, on a prime stretch of China Beach near historic Hoi An a 25-minute drive south from Danang, the Four Seasons Resort The Nam Hai, Hoi An (www.fourseasons.com/hoian/) with its grand villas and spa and splendid service. 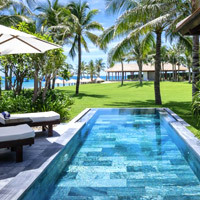 A mod option is the Fusion Maia Danang (fusionresorts.com/maiadanang/), with lowrise white villas set in immaculate green surrounds right by the beach. Think clean lines, minimalism and a hip understated vibe with a 'secret' arched bamboo driveway to usher you into this designer escape with its playful lashings of pink and lavender. And for more stretch room and a more informal vibe with better rates for beach weddings there's the evergreen and upgraded Furama Resort Danang (furamavietnam.com/), one of the first on this spectacular stretch of sand. At the stylish colonial La Veranda Resort Phu Quoc - MGallery by Sofitel, (sofitel.accorhotels.com/la-veranda-resort-phu-quoc) on the southern Vietnamese island of Phu Quoc, weddings are tailor-made to suit individual desires and can be anything from barefoot on the sand to grand and formal in the ballroom. Weddings are ceremonial only and civil marriage registration should be arranged separately. Larger international offerings on this island off South Vietnam include since late 2017, the extensive InterContinental Phu Quoc Long Beach Resort (www.phuquoc.intercontinental.com/) - with wedding venues including a magnificent beach, beachfront gardens, the Magnolia Grand Ballroom (600 banquet style), and the 130-seat The Theatre - as well as the stylishly quixotic JW Marriott Phu Quoc Emerald Bay Resort & Spa (www.marriott.com/jw-marriott-phu-quoc/) with over 11,000sq ft of event space with the largest venue holding 750 persons. Amanresorts (www.aman.com) has some stunning properties across a range of Asian destinations, and a reputation for hosting fabulous wedding and blessing ceremonies. Obviously nuptials in five-star bliss come at a price - but hey, what's money for a lifetime of sweet memories? In Indonesia, get legally married in the jungle at the Amanwana on Moyo Island (you'll have to coordinate this with your local embassy or consulate), or at the Amanjiwo in Central Java, overlooking the world's largest Buddhist sanctuary of Borobudur. Bali, of course, is the spot for romantic unions, and the Amankila (www.aman.com/resorts/amankila), on a headland with sweeping views, promises a magical experience to the strains of Balinese traditional music and dance. Amandari offers a hill country experience with its stone walkways and traditional shrines. 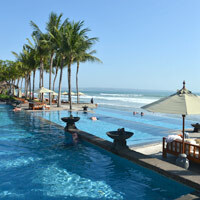 The St Regis Bali Resort (www.marriott.com/st-regis-bali) is a classy and grand venue for a tropical beach wedding. 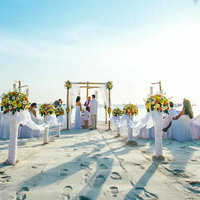 Ceremonies can be held at “Cloud Nine Chapel” on the beach, after which couples can escape to their own “Cloud Nine Honeymoon Villa”. There are dedicated event organisers to ensure a smooth running of festivities. Just up the coast with great views of the seafront The Mulia Resort & Villas (www.themulia.com/mulia-bali/), an unabashed marble and art confection that hugely appeals to Chinese and Asian luxe sensitivities, launched its 2,000sq m beachfront Unity Garden in September 2016 with an alfresco lawn area and space for spectacular Bali weddings under the stars with a cliff-edge temple as a backdrop. The area can hold up to 1,000 persons. The hotel also offers two rather grand ballrooms and conference space for wedding receptions and more. 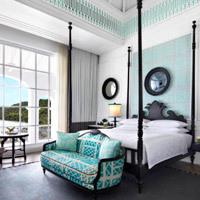 Next door is the grand April 2019 escape The Apurva Kempinski Bali (www.kempinski.com/bali/the-apurva) with stately private villas as well as hotel rooms and suites, set atop a breezy promontory with sweeping views past a central embrace of pools and gardens, on to the beach. Popular spa bolthole Hilton Bali (formerly Grand Nikko, www3.hilton.com/ilton-bali) offers panoramic views from atop a vertiginous belvedere. Pick from the all glass Wiwaha Wedding Chapel set setop a cliff-edge, the garden Kamita Wedding Gazebo, the Graha Paruman Ballroom or the ocean view Taman Sari Cliff Top Garden and Serenity Beach. The Grand Hyatt Bali (www.hyatt.com/grand-hyatt-bali) is a popular Bali wedding venue and hosts beach, garden and pool wedding parties. A favourite venue is the hotel's beachfront Salsa Bar, where you can celebrate 40 feet above the ground, with views of the Indian Ocean. The resort will provide Balinese flower girls if you so require. The hotel is spread out and spacious with mature manicured gardens and more pools than you could shake a stick at. Pick this for a memorable Balinese wedding. The Bali Hyatt in Sanur, rechristened the Hyatt Regency Bali (re-opening Jan 2019 after a major overhaul, www.hyatt.com/hyatt-regency-bali) also has a number of wedding offerings and a lot more flower-themed packages from beach to poolside. Pick a wedding setting of your choice, and an English-speaking priest, as well as a menu of extras depending on the package that you choose. At the spacious, hip and always evolving Westin Resort Nusa Dua, Bali (www.marriott.com/westin-resort-nusa-dua-bali/), a slew of facilities and add-ons await prospective couples hoping to tie the knot. The hotel, known better for its convention facilities, has broken the mould with crisp new rooms, a breezy seafront with restaurants and bars, a children’s pool and an inviting lagoon pool that catches the sun’s rays. A wedding specialist is on hand to walk couples through formalities. There is a range of venues. Pick a beachside location or opt for the Nusa Indah Hall. Newlyweds can strrrretch the celebrations with thoughtful throw-ins like a spa treatment, champagne breakfast and special romantic turndowns. Neighbouring Nusa Dua Beach Hotel & Spa (www.nusaduahotel.com/) is a more modestly priced, fun and family-friendly enterprise, one of the oldest along the strip with its fair share of statues and manicured greens. The Laguna, a Luxury Collection Resort & Spa, Nusa Dua (formerly Sheraton Laguna Nusa Dua, www.marriott.com/laguna-nusa-dua-bali/) caters for receptions with up to 600 guests. 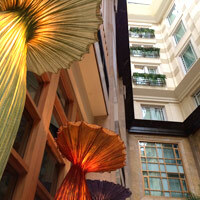 The renovated hotel serves up almost 20,000sq ft of event space. Host a wedding cocktail party or enjoy a private candlelight dinner in the beachfront Laguna Gazebo overlooking the beach and ocean. The hotel will assist with all the planning, including legal registration of weddings. 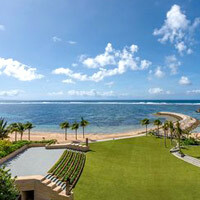 The sprawling Conrad Bali (www.conradhotels.com) in the Benoa area adjoining Nusa Dua is a friendly choice. 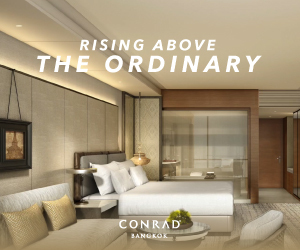 Conrad offers stunning views of the sea from an elevated lobby. A feather in its cap for those in search of a romantic Bali wedding is its Infinity Chapel, a dedicated Bali weddings venue. This all-white, A-frame tented, futuristic venue with floor-to-ceiling glass panels and attractive water features, offers ample light, breeze and views. It is set in a 1,200sq m beachfront reserve and can accommodate 60 guests. Get wed on a floating garden in a water pond or pick a beach venue for an hour. Close by is the intimate and charming 20-villa The Royal Santrian (www.theroyalsantrian.com/) with its signature red umbrellas lining a black tile pool leading to the sea set in verdant gardens. Get wed in the lawns or at the Bali wedding venue pavilion. The exclusive and ultra hip Bulgari Resort, Bali (www.bulgarihotels.com) offers a stunning location for ceremonies in four different settings: water, beach, bale, or pavilion. A wedding planner takes care of any special requests and you may get Bulgari-branded souvenirs to take away. This is a stylish cliff-edge location that will have guests on the edge of their seats on the Big Day. It is a spectacular location for a chilled out Bali resort wedding. 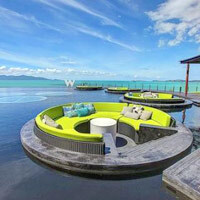 Try a 'Water Wedding' facing the sea set on a 'transparent carpet' floating on - you guessed it - the water. Another stylish venue in the broad neighbourhood is the Banyan Tree Ungasen Bali (www.banyantree.com/ungasan-bali), an all luxury villa affair. The elegant and spacious Ayana Resort and Spa Bali (www.ayana.com - once The Ritz-Carlton in a previous incarnation) in south of Jimbaran caters for weddings in a big way. It is hugely popular for its stunning backdrops and venues that include the vertiginous cliff-edge SKY that seemingly floats off into the horizon 35m above the ocean. With a veritable army of wedding and honeymoon planners, would-be couples can navigate through touchy - and touchy-feely - issues like choosing colour schemes, general decor, flowers and music. Say "I do" (or renew your vows) in the location of your choice; perhaps a glass-walled wedding pavilion with spectacular Indian Ocean views will do? Check out the 681sq m Tresna Chapel. Or pick the Rock Bar with its blazing sunsets for something a bit more adrenalin charged. The dedicated "wedding concierge" will ensure that everything - from the flowers to the ceremony itself - goes smoothly. The hotel recommends that you start planning your wedding three to six months ahead. For more Jimbaran Bay wedding bliss right on the beach, the InterContinental Bali Resort (www.bali.intercontinental.com) offers elegant, romantic indoor and outdoor marriage ceremonies. The resort will arrange legal formalities, as long as it receives the necessary personal documents of the wedding couple (copies of birth certificates and passports, letter of baptism, a divorce certificate if applicable, and four photos of the couple) at least a month before the ceremony. Pick from a beach wedding, the Alun Alun Gardens (up to 150 guests), the Sunset Gardens (up to 600 guests), the Candi Bentar Gardens for something more intimate, or the Puri Kencana Ballroom for a more traditional 500-person bash. The Four Seasons Resort Bali at Sayan offers ceremonies that take place beside the Ayung River, with a backdrop of lush jungle. For a chapel wedding in an exotic setting, the Four Seasons Resort Bali at Jimbaran Bay (www.fourseasons.com/jimbaranbay/) may have on offer a "Balinese purification package" consisting of a cleansing ceremony and prayer and meditation session. This is a classy all-villa hotel perched some distance up from the beach but with stunning views of the bay. A great location for photography. Get wed at Gili Jimabaran gardens (for 100 persons), at the romantic bougainvillea-and-frangipani Waterfall Garden, the Pool Terrace, at the Imperial Villa, at the Jimbaran Gardens, or at Sundara (a 57m overwater bridal walk along the beach over a tongue of blue swimming pool). A all-in deal like the 'Elegant Wedding Package' make offer a two-night stay in a One-Bedroom Garden Villa (with breakfast), floral decorations, bridal bouquet, white Tiffany chairs (30 pieces), two glasses of sparkling wine for the couple, music, gifts, romantic dinner for two and a spa treatment for the blissful couple. 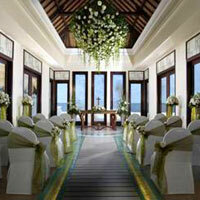 The charming Oberoi Bali (www.oberoihotels.com) in hip Seminyak will arrange a legal wedding, including church minister and civil ceremony. You can also choose to have a non-binding Balinese blessing ceremony. The hotel will also organise a religious renewal of vows ceremony with a church minister for couples who are already married or don’t need a legal marriage certificate. Afterwards, romance rules. 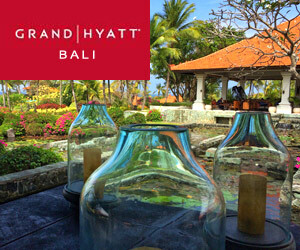 A special touch is the large Balinese swimming pool covered with a blanket of tropical flowers and floating candles. If nothing else catches your fancy, join in the hotel's 'full moon ceremony'. This is one of the original designer resorts on the island much in demand for its local architecture and authentic style. The chic and modern The Legian Bali (lhm-hotels.com/legian-bali/en/) can arrange colourful Balinese or international wedding ceremonies poolside with stunning sunsets as accompaniment or at various venues including the gardens or The Beach House. A 'Sunset Garden' wedding package includes eight Balinese flower girls, welcome drinks, gong, guest book, music, Tiffany chairs, 90-minute spa 'love ritual' for the couple and a pedicure for the bride. Plan on an intimate wedding ceremony for 20 and a cocktail reception for 80. This is a perfect spot for a classy upbeat wedding in Seminyak. Round the corner foot-pumping hip weddings for millennials are the norm at the colourful cushion-littered W Bali - Seminyak (www.marriott.com/w-bali-seminyak/) with about 11,400sq ft of event space..
Also check out the typically Balinese The Royal Pita Maha (www.royalpitamaha-bali.com/) up in the hills of Ubud, with an all new chapel set down in the stunning Ayung River gorge - where screaming whitewater rafters often pass - and plenty of spaces for taking marriage vows. This is an unfussy escape with local features and a warm touch in an all-villa set-up. The elegant Jineng Chapel is another option set higher up the valley with open views. The Hanging Gardens of Bali (hanginggardensofbali.com/), sitting above Ayung River somewhat inaccessibly situated, is suited to smaller weddings. Ceremonies may be held in the privacy of one of the villas, or atop a platform on the seignature twin pools. This a hugely popular selfie spot for its location above the gorge and its iconic cobalt blue pools one above the other. Lacking event space, the rustic pebble-strewn Capella Ubud (opened 2018, www.capellahotels.com/en/capella-ubud/) is nevertheless an enticing spot for intimate weddings and romantic gatherings. The ultra-charming Puri Wulandari (hotelpuriwulandari.com/) on the other hand does offer green terraced grounds above the Ayung River gorge with spectacular views for small size Bali weddings and blessings as well as a picture-perfect infinity pool for pre-nup shots. This is an all-villa affair and tastefully designed. 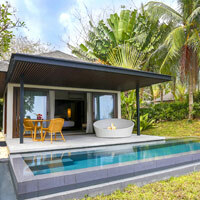 Apres-event settle into a Maharani Two-Bedroom Villa with private pool to savour the newlywed air. The secluded and renovated Kamandalu Ubud (www.kamandaluresort.com) set in lush rice paddy fields above a burbling river is another Bali wedding venue to look at. The resort can conduct the ceremonies in the garden or at a private pool villa. Its 215sq m Bale Ketemu can hold up to 100 persons theatre style and is sometimes booked by wedding parties. The Maya Ubud (www.mayaresorts.com) will arrange paperwork, the religious ceremony and everything else to make your day memorable. This resort is a favoured spa retreat set above a river. A setting high above a verdant valley and floating candles are all part of the deal at Alila Ubud (www.alilahotels.com) where ceremonies can be simple and contemporary, or traditional Balinese style. Sister hotel Alila Villas Uluwatu (www.alilahotels.com/uluwatu) offers grand vertiginous cliff-side romance and magnificent panoramas and sunsets farther south not far from the Bulgari Bali. This is the one to pick for true romance though the newer Alila Seminyak (www.alilahotels.com/seminyak) offers more space and a beach. The more intrepid may look at destination wedding deals amidst giant monitor 'dragons' and azure seas from US$3,700 at the new AYANA Komodo Resort, Waecicu Beach (opened 2018, www.ayana.com). This rate includes up to 70 celebrants. Wedding packages at the resort also include generous pours of sparkling wine (on the house), elaborate floral creations, live band, all under the supervision of a professional wedding consultant. Or pick a wedding on its Ayana Lako d'ia 'phinisi' ship customised with nine bedrooms and a spectacular deck for romantic moments and perhaps a ceremony. Closer to Singapore, a short hop by ferry, the sprawling Bintan Lagoon Resort (www.bintanlagoon.com/) with 300 hectares of beachfront gardens is pulling out all the stops to attract the wedding crowd. There's an 18-hole golf course for those who prefer greener distractions but those with marriage on their minds can pick from several locations including a Great Hall with a pillar-less space for up to 1,300, and the verdant, breezy, sea-fronting space. The hotel has Bintan wedding packages for 30 to 500 people - ranging from 'classic' to 'bohemian' or 'Indian'. More upscale is the spa-and-romance Banyan Tree Bintan (www.banyantree.com/bintan). Goodbye Bali, hello Philippines, where tropical paradise El Nido Resorts in northern Palawan (www.elnidoresorts.com), with access to a host of small idyllic islands, spectacular diving sites and romantic beaches is more than happy to host your nuptials. Think private white sand beach, dramatic limestone hills as a backdrop, waters teeming with fish and coral life, and we haven't even got to the sunsets as yet. The resort has a range of options from family-friendly to private villa luxury. Check. Another option, this time in Cebu (easily accessible from Hong Kong and other gateway cities) is Shangri-La's Mactan Island Resort & Spa (www.shangri-la.com/mactan), set on sprawling grounds with a private 350m manmade beach. Ceremonies may be held in a glass pavilion or on the beach. If you have 1,000 friends, there is an air-conditioned marquee available that will accommodate them all. Try its 'Under the Stars Wedding Reception' package. Another pick at the far southeastern corner of Mactan (Cebu), is the much hyped Plantation Bay Resort and Spa (plantationbay.com/). What sets this place apart from most is the fact that it's lagoon is entirely "artificial". Plantation Bay is an enormous sand-lined bathtub ringed by villas. Outlandish as this may sound, the effect is rather pleasing and the two-storey villas are attractive both in and out. A jetty leads out to the sea for romantic shots with a blue backdrop. Just south of Cebu is the island of Bohol with more romance and adventure than you can shake a stick at. Fall in love, get married, try your luck at a sunset proposal. Our pick is the luxe Amorita Resort (www.amoritaresort.com/) by the One-Of Collection tucked away on secluded Panglao Island (and conveniently connected to the main Bohol Island by bridges). In 2017 this Bohol luxury beach resort brings guests "Love Amorita" - a romantic experience with the introduction of 16 Luxury Villas and two fresh Two-Bedroom Pool Villas for a candlelit "I do" or for families in need of some extra stretch room. The resort is sited on a low headland with grand views over the southern stretch of Alona Beach. Expect complimentary WiFi, paddleboards and kayaks for some salt-in-the-hair workouts. The resort's smorgasbord also includes 98 swish Suites, two sun-drenched pools and new twists on menus with some hard-to-find local Bohol fare. Located in the northwestern corner of Boracay, the private and unashamedly plush Shangri-La’s Boracay Resort and Spa (www.shangri-la.com/boracay) is secluded, swank, and small. It returned 26 October 2018 after the six-month government shutdown of this pleasure island to clean-up waste and restore the beach to its pristine white. Thatched villas creep down the rocky hillside to 350m of private beach. This is a perfect spot for a romantic Boracay resort wedding. Expect breezy views from the hillside looking over azure seas. This is a resort with a bit more luxe than spots along the main drag and one of the best Philippines weddings venues..
Or you could try an old favourite down on White Sand beach, Fridays Boracay (www.fridaysboracay.com/). The resort recommends evening beach weddings just before sunset between 4.30pm and 5.30pm. Fridays Boracay is a stunning wooden lodge construct that has grown and polished its design over the years. It is fun and happening, if a tad past its peak, with great water sports options and fun stuff for kids and families too in case marriage was done and dusted a while back. The resort is at Station 1, a quiter ferry stop a bit away from the nightlife throb and parties farther south. 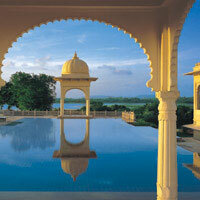 For a spectacularly dramatic destination wedding setting, you can't beat India. The Oberoi Amarvilas (www.oberoihotels.com/amarvilas) does not encourage ceremonies at the hotel itself, but does arrange marriages and renewals of vows off-site at a temple beside the famous Taj Mahal, with the reception or banquet held at the hotel. The Amarvilas rooms overlook Mughal Emperor Shah Jahan's monument to love and in some quarters, the spoiling bathtubs offer the same panorama. Other good choices are the Udaivilas in Udaipur (also from Oberoi, www.oberoihotels.com/udaivilas) and the small, stunningly ornate Samode Palace Hotel (www.samode.com) which is a romantic Rajasthan gem of sorts and not too far from New Delhi by road. 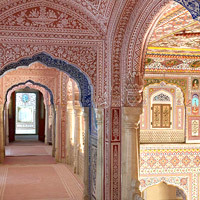 The palace is littered with secret mirrorwork rooms, audience chambers and murals to create an ambience fit for a king. There are gardens, grounds and alternative wedding locations in the desert countryside. The Neemrana group of hotels (www.neemranahotels.com) offers anything from a grandiose ceremony in a palace setting or a more intimate affair on a candle-lit beach on the Ganges. A Neemrana wedding promises “rose petals showering from the sky” and “fireworks to celebrate with the cosmos”. Consider the historic 15th-century Neemrana Fort-Palace on the outskirts of Delhi. The palace hotel of RAAS Devi Garh, also in Rajasthan, (www.raasdevigarh.com/) endeavours to create a “royal” experience when organising weddings within its premises. Ceremonies are performed by a local priest and topped off with fireworks, traditional music and folk dancing. The very impressive Umaid Bhawan Palace Jodhpur(taj.tajhotels.com/umaid-bhawan-palace) is a regal marvel built in sandstone with vast echoing chambers and green acres. With just 22 rooms and 42 suites this is a spot for grand weddings on an intimate scale to handle up to 300 guests in style. Small wonder the place was picked by Indian moviestar Priyanka Chopra and Nick Jonas for their late 2018 destination wedding in India. For more wedded bliss in India, try Taj Hotels, Resorts and Palaces (www.tajhotels.com), with plenty of opulent nuptial options. A huge favourite is the ultra-romantic Taj Lake Palace Udaipur (taj.tajhotels.com/taj-lake-palace) set in virginal white in the midst of a mirror-smooth lake. The Mediterranean-style Taj Exotica Goa, overlooking the Arabian Sea and set in 56 acres of gardens, will lead you to the altar with a Christian wedding and all the trimmings, from pre-wedding spa pampering to post-wedding champagne breakfast. Or choose the traditional Hindu wedding, complete with intricate mehendi (henna) application to the bride's hands and an ancient Vedic ceremony. The Grand Hyatt Goa (www.hyatt.com/grand-hyatt-goa/) is a sprawling stylish versatile space with extensive lawns, beach and ballrooms for all manner of Indian weddings and dances. The Leela Palaces & Resorts (www.theleela.com) caters for weddings, with the five-star Leela Goa (www.theleela.com/leela-goa) a popular beach choice. And in the deep south of Kerala, the very popular CGH Earth Coconut Lagoon (www.cghearth.com/coconut-lagoon) stays true to its roots with a traditional layout and decor overlooking the Kumarakom backwaters. Fancy a houseboat river cruise romance? This is the place for that. Sanya on China's southern island of Hainan is not only a developing holiday destination, but its popularity as a hot wedding spot is increasing as well. The lovely coastline – palm-fringed, white sand, blue sea – and the fact that some of the larger hotels are pulling out all the stops to create a memorable occasion, certainly make Sanya a place to consider for your “special day”. 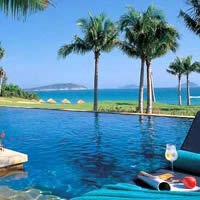 Options for a resort wedding in Sanya could include the modestly-priced Sanya Marriott Yalong Bay Resort and Spa (www.marriott.com/sanya-yalong-bay) on the pristine sands of Yalong Bay boasting carefully manicured gardens fronting the sea and a 830sq m ballroom, or the spacious Sheraton Sanya Resort (www.marriott.com/sheraton-sanya) – “The Official Resort of Miss World” for three consecutive years – with several event spaces including a 1,250sq m ballroom. The 511-room Sheraton offers brisk service, cool water features, and a large stretch of white sand with a broad range of accommodation for wedding guests. Yalong Bay easily rivals some of the best coves in Phuket without the clutter and clatter of the Thai resort and is well worth a look-in if a quiet escape is what you are after. The climate is quite agreeable for most of the year. Still at Yalong Bay, The Ritz-Carlton, Sanya (www.ritzcarlton.com/sanya) offers an ocean-front chapel, a “romanceologist”, and a team of wedding planners for a day (or night) that can be tailor-made to suit the marrying couple’s every need. The hotel caters for both Western and Chinese-style weddings – for an authentic Chinese wedding, traditional dress is provided. Pre-wedding fun is also offered. Ritz-Carlton’s services extend from bridal showers for the ladies to “martini night” bachelor parties for the lads. Oh, and if you’re trying to find an auspicious spot to propose – on a headland nearby, Sanya’s well-known attraction, Luhuitou Park, immortalises the love story of a hunter and a fairy. Upscale choices here include The St Regis Sanya Yalong Bay Resort (www.marriott.com/st-regis-sanya-yalong-bay), a massive regal sprawl with rolling greens, a seven-bedroom Presidential Villa and the Lighthouse venue; and the Park Hyatt Sanya Sunny Bay Resort (www.hyatt.com/park-hyatt-sanya/). Set a 15 minute drive beyond Yalong in a private cove, Park Hyatt is a contemporary construct, a series of brooding grey stone rectangles, a Temple of Doom meets Game of Thrones fantasy where you will be forgiven for thinking the Mother of Dragons is about to swoop down on a fire-breathing beast. It is slick, modern, minimalist, and playful. Walk in through a charcoal entrance down a hushed dark corridor lined in red lacquer and chocolate leather to a high ceiling reception with plenty of light, lashes of crimson, woody tones, and supreme whimsy. Expect cubist rooms, spacious, sealed (most without balconies) air-conditioned and with great bay views. The central lawns are huge and perfect for wedding settings while the non-swimmable beach offers a romantic backdrop for evening wedding ceremonies. The largest event space is 3,606sq ft. The ring-on-the-finger set can head to the Wanda Vista Resort Sanya (formerly the Kempinski Hotel Haitang Bay Sanya, www.wandahotels.com) for a beach wedding. Opt for the ballroom if you are squeamish about the weather, the spacious lawn that rolls right down to the sea, or the functioning lighthouse for a dramatic backdrop. AURA, the chic wedding chapel, has gone after a bureaucratic tangle with the city government that saw the chapel demolished. This has resulted in larger lawn space for bigger events and alfresco functions however. Also along the newer and fast-developing Haitang Bay are biggies Grand Hyatt Sanya Haitang Bay Resort and Spa (www.hyatt.com/grand-hyatt-sanya), the child-friendly Sheraton Sanya Haitang Bay Resort (www.marriott.com/sheraton-sanya-haitang-bay) also with extensive lawns and several wedding venues, and the exceedingly swish Sofitel Sanya Leeman Resort (sofitel.accorhotels.com/sanya-leeman) with terrific rooms and bay views, a large central lawn leading to the beach and a very hip vibe. Top of the range here are uber-stylish The Sanya EDITION (opened December 2016 with 500 rooms, www.editionhotels.com/sanya/) set on a sprawling 50-acre estate fronting emerald seas and a broad swathe of sand, the entertaining dolphin circus Atlantis Sanya (www.atlantissanya.com/) with 5,000sq m of events space, and the highrise Rosewood Sanya (www.rosewoodhotels.com/en/sanya) with a 1,600-person ballroom, a beach lawn for breezy Sanya wedding ceremonies, and a Pavilion for receptions. For something plush yet rustic, though not on the beach, get wed in a Chinese pagoda at Banyan Tree Lijiang (www.banyantree.com/lijiang) under the shadow of the Jade Dragon Snow Mountain and explore the Old Town of Lijiang in southwest China. The hotel has a 'Dongba Wedding Package' available. Or sample the serene Angsana Xi’an Lintong (www.angsana.com/xian-lintong) one of Xi’an’s best luxury retreats modelled after a Tang Dynasty court. The sprawling complex comprises a 400-room hotel, spa and hot springs facility. Rooms are spacious, starting at 60sq m for a Royal Room to 300sq m for the Dynasty Suite; and are fitted with luxurious touches, including wide balconies, plush linens, flat-screen TVs, and circular bathtubs that are filled with rose petals each evening. Get wed in the Great Courtyard or opt for the stately Grand Ballroom. If wedding dessert in the desert takes your fancy, Sun and Sandals Tours (www.sunandsandals.com) can arrange a lavish Dubai celebration. After a church ceremony, the wedding party may be whisked into the Arabian Desert to watch the sun go down over the infinite sands. Couples can choose to be blessed by a priest in a setting rich in Persian carpets, cushions and flame torches. Accommodation for the night is at a campsite modelled on a traditional Bedouin village, complete with modern luxuries. 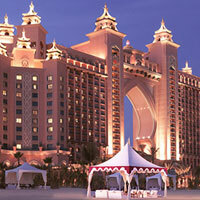 Dubai is not short of top-drawer five-star resort hotels and many offer wedding services. The Ritz-Carlton, Dubai (www.ritzcarlton.com/dubai) has wedding planners on hand to organise tailor-made celebrations right from inception through to the big day. The hotel is sited on a grand stretch of beach. At One&Only Royal Mirage (www.oneandonlyresorts.com), a “celebration consultant” will work with couples to arrange every last detail from the type of ceremony to design of the cake. Couples who chose the Park Hyatt Dubai (www.parkhyatt.com/dubai) for a wedding ceremony were once entitled to a complimentary two-night stay at any of the Hyatt properties around the world on their first anniversary. Check if this is still the case. And The Jumeirah Beach Hotel (www.jumeirah.com/dubai) has indoor and outdoor options for ceremonies, from gardens and terraces to ballrooms and beachfronts with a view of the gleaming Burj Al Arab. And for a bit more razzamattaz nothing quite beats the surreal environs of Atlantis The Palm Dubai (www.atlantisthepalm.com/) where fish might sqim past your window. Ask them to customise a 'dream wedding' for you. There is a rich choice of venues. With easy access from one of the world's best airports (Singapore's Changi) so no guests can complain, there's always Sofitel Singapore Sentosa Resort & Spa (www.sofitel-singapore-sentosa.com/), which emerged from the old Beaufort Sentosa in early 2016, offering all the exotic pleasures of a tropical seaside resort a stone's throw from the bustling Lion City. Singapore beach wedding? No problem. The hotel's wedding planner takes care of everything, whether you want an alfresco do for ten, or a ball for over 200. Yes, there's a beach, spa, solitude, walks and some excellent nosh. Or opt for the colonial chic all-white and very swish former barracks Capella Singapore (www.capellahotels.com/singapore). It serves up ample lawns, sea views, and a charming ambience that will provide a lifetime of memories for any wedding couple. Several indoor and outdoor locations are available. Last, but not least, The Fullerton Singapore (www.fullertonhotel.com) might not be a resort hotel, but set right on the Singapore River with fabulous views and an imposing high-pillared colonial ambience, it is well worth a look. The hotel has its own wedding specialists and a range of elegant venue choices. No lack of photographic opportunities here with soaring Doric columns in all directions, uplights, an atrium lobby, and grand views. The hip stylish and artsy Fullerton Bay Hotel can rustle up a more intimate 'I-do' do with views of the Singapore Marina. The Lantern Rooftop Bar (for up to 250 persons) is a prized venue with a breezy vibe and a glass-wall swimming pool. 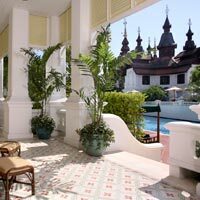 The grande dame of hotels in the city Raffles Singapore (the inventor of the Singapore sling, www.rafflessingapore.com/) returns in blazing white colonial finery mid-2019 after top-to-toe renovations. The Amansara (www.aman.com/resorts/amansara) in Siem Reap, Cambodia, is an intimate 12-suite resort, where legally binding ceremonies can be arranged once a marriage has been registered with the Cambodian authorities. (This takes about three weeks.) Raffles Grand Hotel d’Angkor (www.raffles.com/siem-reap/) is another exotic setting steeped in history and colonial romance. 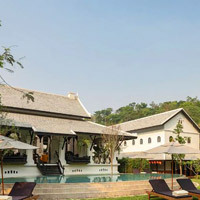 The romantic, woody, rustic-chic Rosewood Luang Prabang (www.rosewoodhotels.com/luang-prabang) opened March 2018 in this sleepy Laos temple town in the hills with 23 smart rooms including Hilltop Tents with tautly stretched canvas and timber floors, all with bathtubs and spoiling toiletries and attentive service. 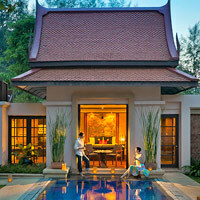 The 'tented villas' as Rosewood likes to call them draw on French-Lao architectural inspiration. This is the perfect spot for an intimate and other-worldly romantic escape and Asian jungle wedding of a lifetime. In Sri Lanka, at Amangalla, (which lies within the old Dutch Fort of Galle, www.aman.com/resorts/amangalla), a wedding ceremony can be held in an historic Anglican church or you can choose a civil ceremony in the resort’s garden pavilion. Or cruise across the Pacific to Bora Bora and the new Four Seasons. Across the Indian Ocean in the opposite direction is the Four Seasons Resort Seychelles (www.fourseasons.com/seychelles) with tree-house villas, plunge pools, a jungle getaway for incurable romantics and wedding consultants to plan every detail. 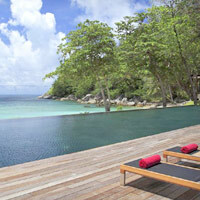 Also consider the Raffles Seychelles (www.raffles.com/praslin/) with equally grand settings and views. What are you waiting for? Tie the knot.